There aren’t many games that have managed to carve out a place in my bitter, bitter heart like Super Smash Bros. Melee. HAL Laboratory’s ode to all things Nintendo wasn’t just an attempt to cash in on fans’ nostalgia, as the frantic gameplay relied on a strong undercurrent of skill and timing that inexperienced players could easily miss. Competitive Melee play was an art, and one that has stood the test of time surprisingly well, earning it a spot as one of my favorite games of all time. After Brawl introduced Smash Balls, laggy online play, and a variety of poorly-balanced characters to the mix, I resigned myself to the knowledge that the Smash series had past its prime. I’m genuinely overjoyed at how wrong that sentiment was. Super Smash Bros. for Wii U doesn’t just right the ship for the series, it steers it into promising new waters, and it might just be the best game the series has produced. Those new waters, specifically, refer to the realm of multiplatform availability. For the first time ever, Super Smash Bros. was released on a console and handheld system. Both offer feature parity apart from a few platform-exclusive maps and modes. If there’s one disappointment I suffered from the Wii U version, its exclusive maps and mode aren’t as compelling as the 3DS exclusives. While 3DS players get to enjoy novel and multifaceted maps based on Animal Crossing’s Tortimer’s Island, Super Mario’s 3D Land, Pokemon’s Prism Tower, Mario Kart’s Rainbow Road, and Zelda’s Spirit Train, Wii U players get a measly three exclusive maps. Of them, the Mario Galaxy map is a real treat, with its unique gravity causing projectiles to arc around the surface of the level. The exclusive Town & City map from Animal Crossing is much less interesting despite a few time-based gimmicks, and the Pilotwings map is fun, but a little too reminiscent of other flight-based maps in past games. It’s also worth noting that the Ice Climbers duo is no longer playable due to the hardware constraints of the 3DS. 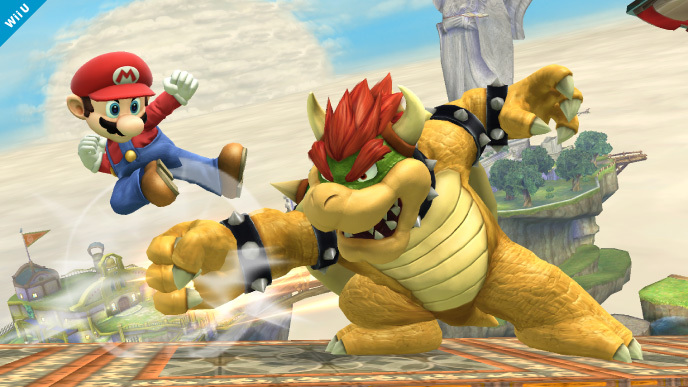 Nintendo wanted parity between both versions in terms of the roster and cut the characters from the Wii U version. Ultimately, though, the multiplatform integration ends up benefitting the Wii U version more than hindering it. In a clever twist, players can use their 3DS as a controller for the onscreen action, meaning that not all players need to have a Wii Remote or a Pro Controller. If four players do have Pro Controllers, four more can join in via their 3DS systems for an eight-player brawl. Even if you have to use AI to fill in a few player slots, I’d highly recommend trying out the eight-player smash on one of the specially-designed maps - which are also exclusive to the Wii U. It’s a ton of fun, and one of the definitive reasons to buy the Wii U version - especially when you crank everyone’s handicap up to 300% and play on the smallest map. The other exclusive mode, Smash Tour, isn’t as consistently fun. It places players in a Mario Party-styled boardgame and challenges them with collecting power-ups that will help them defeat one another in a final battle. If any two players touch on the board map, it will trigger a four-player fight with unique conditions and items. Due to the random nature of the battles and power-up dispersal, these fights range from fun to frustrating and back again. Much like in Mario Party, it’s not uncommon to see your luck turn completely over the last few turns of a match. If that sounds like a good time to you, there may be a lot of fun to be had in Smash Tour’s three maps. Smash fans are no stranger to options, and modes like All-Star, Multi-Man Smash, Target Blast, and Home Run Contest will be familiar to anyone who’s played the series in the past. Trophy Rush joins these modes as yet another way to put your favorite characters to the test. This mode plays out like a frantic puzzle game, with colored blocks and wooden boxes falling from the sky. You must break the pieces by attacking them to score points, and connecting multiple like-colored pieces will create a chain combo. Earn enough points, and you will activate a limited-time power-up that gives you collectible trophies for everything you smash. As far as Smash side modes go, it’s not a classic like Home Run Contest or 100-Man Smash, but it’s fun enough to justify more than a few hours of distraction. All of these modes are peripheral to the core Smash mode, however, and it’s a testament to the sheer amount of content in this game that I’ve gone this long without even touching on the heart and soul of it. Series fans know what to expect out of Smash mode; it’s an all-out brawl for up to four players or AI combatants, starring the best and brightest of Nintendo’s past… and a few head-scratchers like the Wii Fit Trainer, R.O.B the Robot, and Mr. Game and Watch. The game’s roster attempts to cater to a wide range of Nintendo fans, and acknowledges the company’s downs as well as its ups. Two of the three aforementioned characters are already fan favorites despite their status as joke characters, and I expect the Wii Fit Trainer to join them shortly thanks to her array of quirky yet powerful moves. All things considered, the roster has expanded in a much more satisfying direction in the Wii U version than it did in Brawl. Characters like Pit, Sonic, and Meta Knight return from Brawl (though Snake is nowhere to be found), but they’re better balanced this time out. King Dedede feels stronger to counterbalance his clumsy movement, while Pit’s spammy flight and sword spin moves have been neutered to make him more fun to fight against. It’s the new characters that’ll really turn heads though, and I have to compliment developer Sora on some very clever choices in that respect. Shulk from the Wii’s Xenoblade Chronicles is perhaps the most natural - yet unexpected - inclusion, and his Over+B move, which sends him leaping in a sideways arc, makes him a tricky fighter when he needs to be. Still more Fire Emblem characters have been added to the roster, though in the case of Lucina and Robin I can’t complain. They are particular favorites of mine from one of the best Fire Emblem games out there, and although Lucina plays a little too much like Marth, Robin is easily the most satisfying character to play for me. His/her charge move changes the longer you charge it, and his/her recovery move actually strikes below the character model multiple times in quick succession, making it one of the more tricky moves to counter. I could waste a lot of space detailing the intricacies of each new character, but instead I’ll boil it down to a few key points that I feel get across the game’s style succinctly. The aforementioned Wii Fit Trainer is an absolute riot to play. Her B move is reminiscent of Samus’ charge blast, except it fires a massive sun beam out instead, and each of her Smash Attacks takes the form of a yoga pose, making her both hilarious and surprisingly deadly. The Villager can plant a tree which he can then chop down onto an enemy for massive damage. The Duck Hunt Dog, perhaps the most ludicrous inclusion, can launch explosive barrels that players can bounce remotely by tapping a button. Finally, Zero Suit Samus and Sheik are now separate menu selections instead of character transformations. The inclusion of Zero Suit Samus in particular as a separate character is smart, because it means you no longer have to rely on a Smash Ball to control her, and you’ll have more chances to master her powerful moveset. Despite the massive size of the roster, Sora does a great job balancing the characters so that all of them can feel powerful with the right amount of practice. If there are any lame ducks on the roster, I’d point my finger at Palutena and Ganondorf. Palutena seems underpowered with her weak left/right Smash, while Ganondorf as always seems slow and imprecise. That could just be due to my lack of experience with the characters, though, and I’m sure someone out there will become great with them. The stage lineup is equally diverse, though at times I felt it culled too much from the series’ admittedly storied past and didn’t present enough memorable new options. Classics like Brinstar, Hyrule Castle, and Battlefield are represented, and are still some of the best maps in the game. A new WarioWare-themed map called Gamer, which sees players periodically hiding from the death gaze of a peeping mother, is probably my favorite of the new bunch, though as mentioned earlier most of the 3DS maps are excellent. The Wii U version benefits from having eight-player maps too, and these massive arenas take full advantage of the space afforded by most modern HD television screens. Classic mode returns yet again, and allows players to battle through a ladder of increasingly challenging opponents culminating in a final boss battle. There isn't much new to latch onto here, but the classic gameplay still holds a lot of water. Match variations like battling many tiny Yoshis or fighting one big, iron-clad enemy still feel fresh even all these years later, and the final battle against Master Hand has seen a few tweaks that'll keep you guessing - the first few times you finish the game, at least. If you aren't feeling the competitive modes, a new co-op campaign has also been introduced. A series of one-off challenge missions, "campaign" might be a bit of a misnomer for this fun yet incredibly challenging mode, but it does have a distinct beginning and end point, with numerous rewards doled out in between. This intense series of challenges culminates in a frantic battle that pits you and a friend against the game's entire roster, and it's an insane amount of fun. 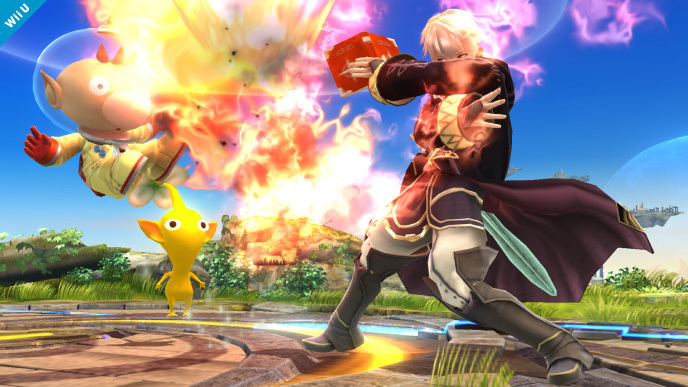 Online play returns from Brawl, but unlike last time, these matches aren’t as laggy. No matter how you slice it, Smash is an incredibly fierce and fast game, and any online play will introduce a slight amount of lag into the experience. However, I was surprised by the competence with which the online modes were executed, and I rarely if ever experienced lag beyond what I would expect to see in other modern fighters. All the content in the world doesn’t mean a thing without solid gameplay, though, and it’s here that Smash Bros. for Wii U really sails above the competition, and even its own predecessors. The balance between characters is so sublime, the speed and precision of control so spot-on, that I’d be hard-pressed to find a single flaw in the formula. As mentioned earlier, I do think that Palutena and Ganondorf aren’t inherently as powerful as other characters, but I still felt that, with enough practice, I could become good with them. And that’s the key to mastering this massive game: dozens upon dozens of hours of practice. If you’re looking for a game massive, multifaceted, and fun enough to eat your life for the next six to twelve months, you’ve found it in Super Smash Bros. for Wii U.
Bayonetta 2 is a relentlessly entertaining ride from start to finish, with pacing meticulously designed to wring every last drop of adrenaline out of you before reigning things in with a quiet, humorous aside. Alternate costumes, weapons, challenge rooms, co-op modes and more await you after you’ve seen through the lengthy campaign, and a copy of the original - excellent in its own right - is included gratis. Action fans would have to be insane to pass this one up.